Merlene Marcelo has been in the business of creating beautiful wedding gowns for fifteen years now and has built her business to include 60 workers. To Merlene, “The wedding gown has the power of imbuing the woman who wears it with a magical allure. Perhaps this is because it is an image tied to the most unique of traditions, or because it is truly difficult to resist its romantic charm. Wearing it on that big day, which should be a once-in-a lifetime event, is like entering a marvelous fairytale. Designer bride, Merlene Marcelo. Photo by Raymund Marcelo. 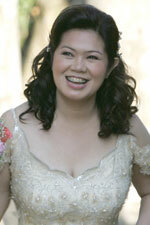 Last April 10, 2005, it was Merlene’s turn to become the bride. Merlene saw herself as the “princess” for that once-in-a-lifetime event, the concept of which was reflected in the gown, the entourage, the flowergirls, even the venue with its cascading flowers and draperies. True enough, the color by itself is completely unique: champagne organdy with duchess silk backing, with 3 dimensional artwork designs with exquisite details which she got as an inspiration from her recent trip to Rome, Italy. 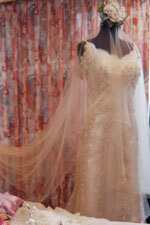 Merlene’s Wedding gown. Photo by Raymund Marcelo. The girls’ motif was in different shades of pink. The artwork used for her wedding was reflected on her whole entourage. The men wore barongs. The little boys got the small version of the Mao collar barong of the groom, while the rest wore standard collar barong. She also made the wedding clothes of her family, her close friends, some relatives on Willy’s side, and even her office staff. Merlene met Willy (William R. Veto, Jr.) during college at the debut of her cousin. They kept in touch after and became good friends. Willy left the country for the U.S. to take his MBA at NYU then his law degree at Fordham University. Eventually, he settled in New York and worked there. Through the years, however, they kept in touch through emails, phone calls, and he even made a trip to Manila to visit her. Through her years in the wedding industry, she made new friends with co-suppliers. They share booth space in fairs and refer clients to each other. It is no surprise then she would trust these same suppliers for her big day. With good supplier friends at the helm, her wedding became her fairy tale come true.